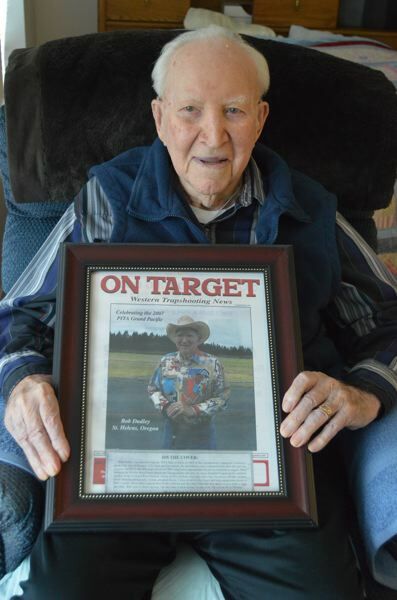 At 100 years old, Scappoose resident Bob Dudley has no problem recalling how he made his way from Madison, Wisconsin, to Oregon in 1923 — he sat in a homemade wooden box strapped to the running board of his parents' car. "I had trouble keeping the bugs out of my mouth," Dudley says with an infectious laugh as two of his daughters laugh alongside him. It's not unusual for Dudley, who celebrates his milestone birthday today, Friday, Oct. 20, to crack jokes with his daughters, Shirley Charlton and Sharon Howell, who regularly visit him at his residence at Brookdale Rose Valley in Scappoose. Howell says her father worked a lot when she and her siblings were growing up and they didn't see him much. Visiting with her father now, she's been able to learn a lot about his life and his sense of humor. "Really what gets us now is his good sense of humor," Howell says. "A lot of time he'll tell a joke, and we wonder how he remembers the joke, or where he got the joke, or heard it to repeat it." As Dudley sits and chats in his room, Charlton takes short videos of her dad telling stories. Listening to Dudley reminisce gives his daughters a chance to learn more about him. Dudley is one of seven siblings and grew up on a dairy farm on Sauvie Island after his family moved to Oregon when he was six. He remembers waking up at 3 a.m. to milk cows and do farm chores before going to grade school. Dudley graduated from Scappoose High School in 1938 with a series of titles and accolades to his name. He served as class president all four years of high school and was a member of the Future Farmers of America and an athletic organization called the Order of the S.
Dudley also ran track and played football team. Scappoose High is also where Dudley met his sweetheart and first wife, Velma. Over their 50-year marriage, the couple had five children — Phillis, who died in 2007, Sharon, Shirley, Kathy and Jack. After Velma died in 1988, Dudley later remarried. Dudley attended Benson Polytechnic, a trade school, after high school, where he studied to become an electrician. Dudley took a job at the St. Helens Paper Mill after graduation and worked there several years before switching to a career with Day Electric. He later owned two different electrical shops in St. Helens — one he co-owned with a friend, and the other he ran by himself in the 1970s. "Being an electrician is one of the most rewarding things," Dudley says, adding of electricy that it's "something that you can't see and you have to work with it by taking measurements. ... I learned it's one of those things, if you don't know what it's all about it, you better leave it alone." Dudley is a member of the Elks Lodge and of the Grand Lodge of the Ancient Free and Accepted Masons of Oregon. Dudley has a decorated history shooting trap and was featured on the cover of On Target Magazine in 2007. Trapshooting is a sport where participants shoot at clay pigeons released from spring-loaded traps. Over his many years participating in the sport, Dudley made a name for himself and was inducted in the Amateur Trapshooter Association Hall of Fame in 1991 and the Pacific International Trapshooting Association Hall of Fame in 1995. Many of his awards adorn the walls of his room still, enclosed in glass cases. When asked, Charlton and Howell said they were suprised that their father said he was most proud of his work as an electrician. They were sure it would be his trapshooting accomplishements. "He was always working or trapshooting and we're finding out so many interesting things about him now," Howell said.